When the earthquake struck, hundreds of students at Salesian schools were killed—many studying to become teachers. Today, in Salesian schools throughout Haiti, more than 1,200 teachers have been hired—most of them trained at Salesian institutions. When the earthquake struck, hundreds of students were killed—many studying to become teachers. 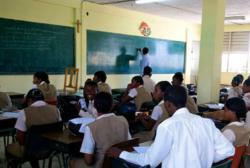 Today, in Salesian schools throughout Haiti, more than 1,200 teachers have been hired. In Salesian schools throughout Haiti, more than 1,200 teachers have been hired—most of them trained at Salesian institutions. As the world marks World Teachers’ Day, Salesian Missions remembers the teachers-in-training that were killed when a devastating earthquake struck Haiti on Jan. 12, 2010. Today, Salesian Missions is proud to report that more than 1,200 teachers have been hired—most of them trained at Salesian institutions. Nothing could have prepared the Salesians—or the Haitian people—for the massive devastation and heartbreaking loss that occurred that day. Hundreds of students were killed—many studying to become teachers. More than 250 unsuspecting students, numerous teachers and three Salesians were killed. The Salesian Missions Office for International Programs, located in New Rochelle, NY, was assigned the task of coordinating international Salesian relief efforts immediately after the earthquake. Early efforts focused on providing basic human needs such as food, water, medical supplies, survival kits and tents for shelter. Thousands of refugees were housed within the confines of Salesian facilities which were not destroyed, and thousands more were provided food. Prior to the earthquake, the Little Schools of Father Bohnen—“Oeuvre des Petites Ecoles de Père Bohnen” or OPEPB in French— provided education ranging from preschool to vocational training. Teacher training programs educated teachers to serve at the Little Schools and Early Learning Centers. In addition, in Salesian schools throughout Haiti, more than 1,200 teachers have been hired—most of them trained at Salesian institutions. “While much progress has been made, life in Haiti is far from normal. Help is still needed to serve the children and families still trying to recover from the disaster,” says Father Mark Hyde, executive director of Salesian Missions, the U.S. development arm of the Salesians of Don Bosco. Today the efforts are focused on rebuilding the country, beginning with providing for and educating its youth. Teacher training continues and enrollment has increased. For more information about Salesian Missions and its work in Haiti, visit http://www.ProgressInHaiti.org or download a special 2-year report on progress in Haiti since the 2010 earthquake. For more articles like this, go to MissionNewswire.org. Salesian Missions is headquartered in New Rochelle, NY. The mission of the U.S.-based nonprofit Catholic organization is to raise funds for its international programs that serve youth and families in poor communities around the globe. The Salesian missionaries are made up of priests, brothers and sisters, as well as laypeople – all dedicated to caring for poor children throughout the world in more than 130 countries, helping young people become self-sufficient by learning a trade that will help them gain employment. To date, more than 3 million youth have received services funded by Salesian Missions. These services and programs are provided to children regardless of race or religion. To date, more than 5 million Americans have contributed financially to this work. For more information, go to http://www.salesianmissions.org.